I can't believe how the time is flying by. The men have been busy ... living the 'normal Christian life' ... which is applying God's Word to every situation ... sharing Jesus ... being practical ... and going where God leads. 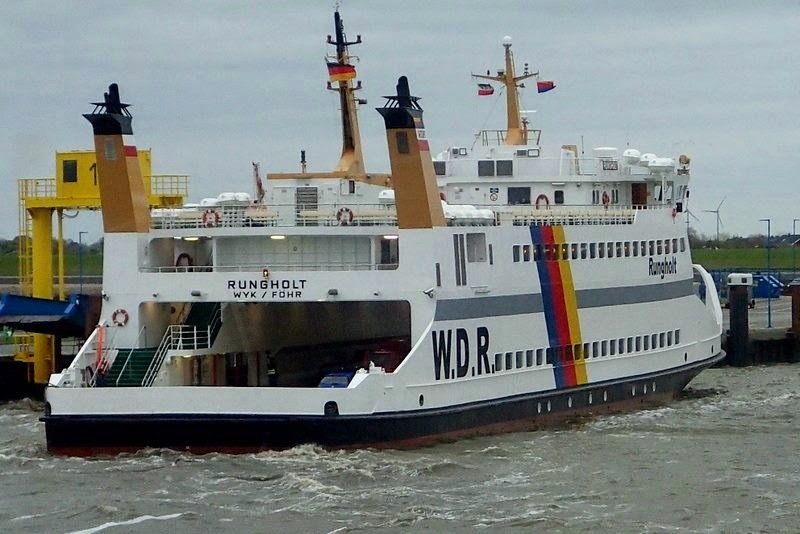 "... the only way to access the island of Föhr is by this ferry. We came close to having to overnight there arriving at the dock 2 minutes before departure. Had spent the afternoon with a local fellowship there sharing the good things of our Lord Jesus with them - wonderful! " I was just looking at Andy's Facebook page and came across his posting today. Wanted to share it on this blog because it's a good reminder to us all. "Take time to listen to what people are burdened by and point them to the way that leads to peace thru Jesus Christ! He continues to be the burden lifter in this generation. Had an opportunity today to chat with someone about how to receive help in the name of Jesus - the conversation developed thru chit-chat about dogs, photography, chimney problems. Don't avoid people - be interested - you may just be the person to give them direction. The Holy Spirit is waiting for you to take a step - do it." 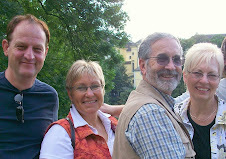 Well, Detlef and Andy arrived in southern Germany on April 10th and will be there for about 5 weeks. Already the first week is over ... and what did they do? Starting from the moment they landed, it's been a time of sharing the Good News of Jesus ... the Saviour, the Deliverer, the Healer. They have had wonderful opportunities to see God working in people's lives, saving them, healing them, and setting them free. In large gatherings? No. But in the one-on-one meetings with individuals who are desperate for a change in their lives. The Lord had already prepared the field. Detlef's brother-in-law and his wife (where the men are staying) had already been busy planting seeds prior to our men's arrival. From the moment the men came, the people started to come. Expectant. Andy took this photo of Detlef photographing from the top of the vineyard hill overlooking the town of Erlenbach ... a town that has again been impacted for the Lord. Today, the men drove 6 1/2 hours to northern Germany. They are settling in and eager to see what the Lord has prepared for them there. "Go you into all the world, and preach the gospel to every creature. He that believes and is baptized shall be saved; but he that believes not shall be damned. And these signs shall follow them that believe; In My name shall they cast our devils ... they shall lay hands on the sick, and they shall recover ... and they went forth and preached every where, and the Lord working with them, and confirming the word with signs following." Well, it's been busy! Nicely busy! Very busy! Productively busy! There have been trips to Germany and several to Cuba as well. It's just, well, that I forgot to post here. Oh my. That's going to change. Right now, I'm in the process of updating the whole Gottes Wort für heute website. We've been adding lots of new material. As well, we started Gottes Wort Facebook and have been adding stuff there as well. So, what's next. The men, Detlef and Andy (Wolfgang) are heading to Germany in April/May. They are in the process of arranging their itinerary and it's sounding exciting. I'll try to post here what they're doing ... but do follow along on the Facebook page as well. OK, back to working on the website ... when you check it out, you'll see that there's a whole new look to it.